Today was one of *those* days. I've had worse. I'm sure I'll have far worse in the future. So perhaps disappointing is the best way to describe it. I had intended to make cauliflower biryani tonight. Before the cauliflower I bought the other day finally goes off. But what with the pants day and the cold weather, as I drove home, all I could think about was a lovely warming bowl of something red that would give me the equivalent of a food hug and make the end of my day a little better. This could have been something like gumbo or jambalaya; cream of tomato soup or chilli con carne; my staple larder vegetable sauce over pasta; Mr Bridestock's Chorizo and Butterbean Stew or even the Mixed Bean Chilli I tried back in November. But no. 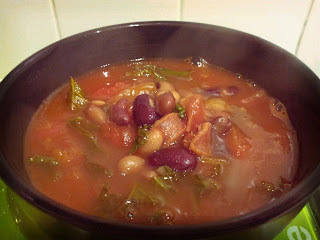 I stupidly decided several months ago that it might be fun/interesting/challenging/educational/... to try a new recipe every day so bound by my own stupidity, I gave the Chorizo and Chickpea soup from BBC Good Food a whirl. Nothing doing. Despite it having a five-star rating after 60 reviews (my one star couldn't tip the balance), I have to say that this was another disappointing waste of ingredients. The soup was watery and bland. I should've figured this when the instructions amounted to 'Boil a tin of tomatoes with a tin of water and a stock cube' I'm not a food snob, but having spent some time learning from all these recipes how to spice a dish like this, the appeal of tinned tomatoes and Knorr's finest is wearing off. I even threw in some spices and a little touch of sugar to take away the nasty metallic tang of the tomatoes. But nothing could save it. It wasn't helped that I had Tiger Bread to eat it with. Watery, metallic soup or a big doorstop of bread? It's no wonder the scales resolutely refused to shift in a downwards direction over the past week, despite lots of running. If you want to see if this recipe does it for you, you can find it here.